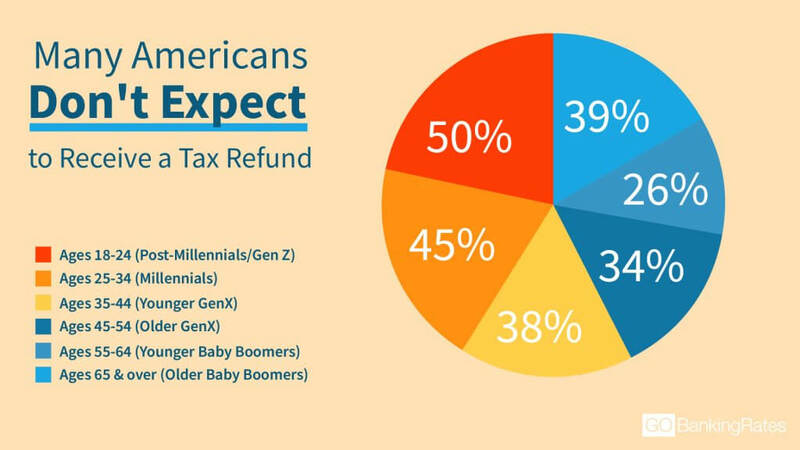 Here's how Americans plan to use their tax refunds. With the average tax refund totaling approximately $3,000, tax filers should plan how to spend this windfall in 2019. Many Americans plan to spend their tax refunds wisely, a recent GOBankingRates survey found. Among all age groups, millennials ages 25 to 34 are more likely to use their refunds to pay off debt. 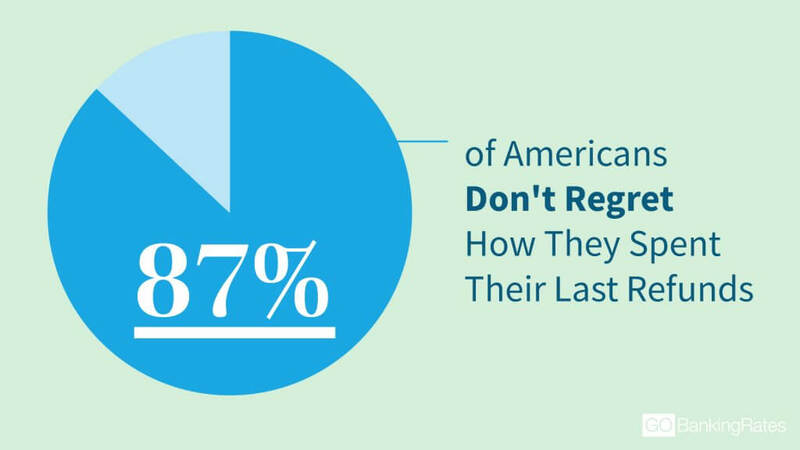 It’s safe to say that most Americans don’t look forward to tax season every spring. However, the refund that a majority of taxpayers get can make the tedious process of tax filing worth the effort. For the 2018 tax filing season, the IRS anticipated that 70 percent of taxpayers would get a refund. Whether such a high percentage of taxpayers will get a refund in 2019 as a result of changes to the tax law remains to be seen. But one thing is for certain: Americans are already thinking about how they’ll use their refund if they get one, according to a new survey by GOBankingRates. The survey polled 1,001 Americans to find out if they’re using their tax refunds responsibly. The top thing that taxpayers plan to do with their refunds — if they get one — is paying off debt. According to the survey, 27 percent chose this option. It’s not surprising that more than a quarter of taxpayers want to use their refund to help pay off what they owe, because household debt in America is at an all-time high of $13.29 trillion, according to the Federal Reserve Bank of New York. A separate GOBankingRates survey found that the average debt among more than 5,000 adults polled is $52,458. Despite rising debt levels in the U.S., a smaller percentage of respondents said they plan to use their refund to tackle debt in 2019 compared to 2018. Last tax season, about 36 percent of respondents said they would use their refunds to pay down debt, which is almost 10 percentage points higher than in this year’s survey. Other common ways respondents plan to use their refunds are to invest, make a major purchase on a necessity and save in a non-retirement account — each of which received 9 percent of the responses. The least common way that taxpayers plan to spend their refund — with only 3 percent of the overall responses — is on a splurge. The survey found that younger adults are more likely than older generations to want to invest their refunds. When asked what they want to do with the money they’ll get back from the government in 2019, 11 percent of respondents ages 18 to 24 and 13 percent of respondents ages 24 to 35 chose “invest it.” Gen Xers ages 45 to 54 were the least likely to want to invest their refund, with only 6 percent choosing this option. Millennials ages 25 to 34 had the highest percentage of respondents who said they wanted to pay off debt: 38 percent. A separate GOBankingRates survey found that this age group has more credit card debt than any other age group except baby boomers ages 55 to 64, which could help explain that figure. The survey also found that women were more likely than men to want to use their refund to pay off debt — 30 percent versus 25 percent, respectively. 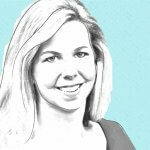 However, men were more likely to want to invest their refund than women — 12 percent versus 7 percent. Respondents were allowed to select multiple answers. When GOBankingRates surveyed taxpayers in early 2018 about how they would spend their refund, 43 percent said they planned to put it into savings. However, this new survey found that only 8 percent of respondents put their refund in a non-retirement savings account and 4 percent stashed it in a retirement savings account. What did most taxpayers do with the money instead? The survey found that 29 percent used their refund to pay off debt — the top response among respondents. Gen Xers ages 35 to 44 and millennials ages 25 to 34 were most likely to have used their windfall to pay off what they owed, with 38 percent and 37 percent, respectively, choosing this option. An overwhelming majority of Americans appear to be happy with how they spent their 2018 refund. The survey found that 87 percent of respondents don’t regret what they did with the money. Baby boomers ages 55 to 64 were the least likely to feel any guilt about how they spent their refund, with 95 percent answering that they had no regrets. Young Gen Xers, on the other hand, were more likely to second-guess their choice, with 19 percent saying they regretted how they spent their refund. The survey found that, on average, taxpayers expect to receive a $3,030 refund. That’s close to the average tax refund Americans have received in recent years. In 2018, the average refund was $2,899, according to the IRS. And, the average refund in 2017 was $2,888. According to the survey, adults 65 and older expect the biggest refund in 2019: $5,403, on average. 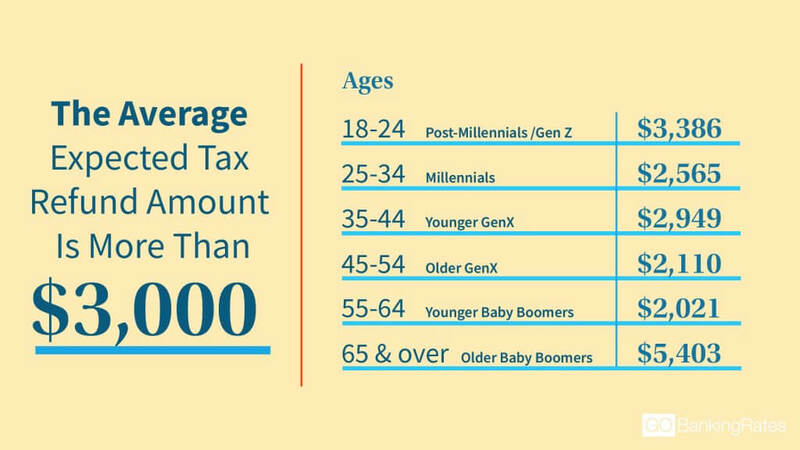 Boomers ages 55 to 64 expect to get an average of $2,021, which is a smaller refund compared to other age groups’. And, women expect to get significantly less than men — $2,498 versus $3,616, on average. The difference in expectations is likely tied to the gender wage gap between women and men across the U.S. Most taxpayers don’t plan on waiting until the last minute to file a tax return. The survey found that 16 percent of respondents expect to file a return in January, 26 percent plan to file in February and another 16 percent will file sometime in March. Only 12 percent expect to file in or after April when tax returns are due. 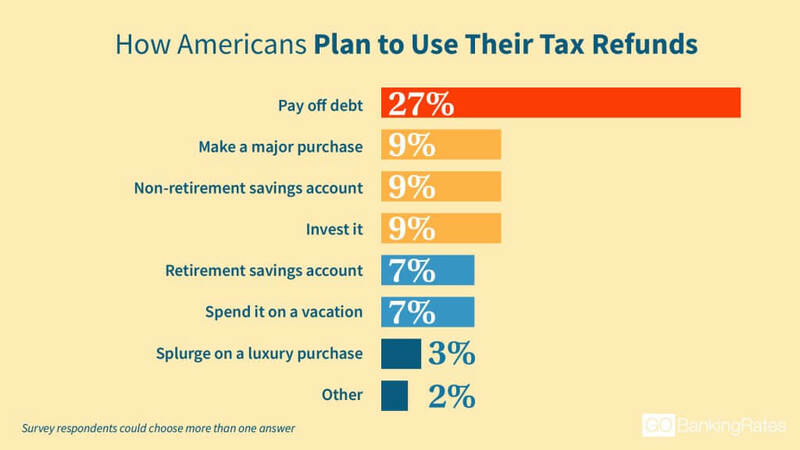 More than a quarter of respondents said they don’t plan to file a return. There are times when you don’t have to file taxes, such as when your income is below a certain threshold. But if you owe taxes and don’t file a return, you will have to pay penalties and interest and could be subject to a tax levy — which means the IRS will seize your property if you don’t pay your debt. The survey respondents who do plan to file a return expect to get a refund relatively quick. In fact, 60 percent expect to get money back within three weeks or less. According to the IRS, most refunds are issued within 21 days of filing a return. You can check the status of a refund by using the “Where’s My Refund?” tool at IRS.gov. Thirty-eight percent of respondents said they don’t expect to receive a tax refund in 2019. That’s slightly higher than the 36 percent who said they didn’t expect to get a refund in 2018. Adults 65 and older are less likely than younger respondents to expect a refund when they file their returns in 2019. Half of the respondents in this age group said they won’t get money back from Uncle Sam. And, 45 percent of younger baby boomers ages 55 to 64 said they won’t receive a refund in 2019. Millennials, on the other hand, are more likely to expect to get money back next spring. The survey found that only 26 percent of respondents ages 25 to 34 said they won’t get a refund in 2019. Although a tax refund can feel like a windfall, it’s not actually a good thing. It means that you let the government hang on to your money interest-free throughout the year. You could be better off getting more in each paycheck to pay down debt or invest so your money can grow. If you regularly get a large refund, you might need to fill out a Form W-4 to adjust your tax withholding and hang on to more of each paycheck. You might also need to adjust your withholding to avoid owing taxes next spring as a result of changes in the tax law. How Should You Spend Your Tax Refund? Pay off debt. If you aren’t among the 27 percent of respondents who plan to use their refund to tackle debt, consider using the cash you get to help pay off what you owe. Focus on first paying off high-interest debt — such as credit card debt — to reduce the total amount that you pay. Create an emergency fund. A separate GOBankingRates survey found that 32 percent of Americans have $0 in a savings account. That likely means they don’t have enough cash to cover emergencies. Stashing your refund in a savings account can be an effective way to build an emergency fund so you don’t have to rely on credit to cover unexpected expenses. Open a Roth IRA. Take steps now to reduce your tax bill in retirement by saving in a Roth IRA. In 2019, you can contribute up to $6,000 to a Roth IRA — or $7,000 if you’re 50 or older. Then, you can withdraw money from a Roth IRA tax-free in retirement. Invest in yourself. One of Americans’ biggest financial fears is always living paycheck to paycheck, a separate GOBankingRates survey found. If you’re stuck in this cycle, you might be able to break it by taking steps to climb the career ladder and make more money. You could use your refund to hire a career coach, take courses online to improve your skills, attend conferences or join networking groups, or even launch your own business. Click through to discover the worst things to do with your tax refund. Methodology: For this survey, GOBankingRates asked the following six questions: 1) What do you plan on doing with your tax refund? Select all that apply. 2) How did you spend your last tax refund? Select all that apply. 3) How much money do you expect to receive this year as your tax refund? 4) How soon do you expect to receive your tax refund after you file your return? 5) When do you plan on filing your individual tax return for tax year 2018? 6) Do you regret how you spent your last tax refund? The survey was conducted by Survata, which interviewed 1,001 online respondents between Nov. 16, 2018, and Nov. 19, 2018.